This innovative, versatile door hanger will stay where it belongs - on the door and off the lawn. It works on even difficult door handles and can broaden your distribution options to include surfaces not compatible with other types of door hangers. These door hangers were developed to support door-to-door distribution of door hangers onto today's more modern door knobs. By eliminating the die cut and utilizing a unique stretchy band (that not only stretches around unusual shaped handles but also retracts to hold tightly to the handle) you also gain valuable design space for an uninterrupted message. No more designing around a hole in your print piece! All Band-It® Door Hangers securely fit 99% of doorknobs - traditional hole and slit die cut door hangers simply don't hold up on today's modern knobs. 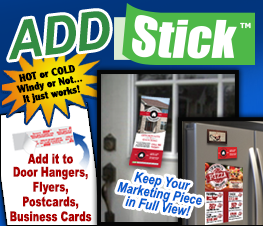 Add Stick to your door hanger for TWO DISTRIBUTION METHODS -- the ultimate door hanger solution! No. This distribution style is unique as it does not include the traditional hole and slit to attach it to the door knob. It uses the innovative Band-It to attach it to the door knob. The Band-It is more secure and versatile than the traditonal die cut hole & slit style. Yes, if you order a Band-It Product, or add Band-It to your order, that includes the addition of a small drill hole into your printed piece as well as a separate bag of our Band-It bands so you can easily insert them during distribution. No. The Band-It bands are designed specifically for door to door distribution so we made them large enough to stretch around various styles of levers but also small enough so they won't easily fall off the knob. No. A bonus of using the Band-It for door to door distribution, is that it doesn't require the heavy paper weight to stay securely on the door knob as the more traditional die cut hole style does. Band-It can be used with lightweight paper stock or heavy card stock.